Christine from Port Charlotte, Philippe from Brooklyn & 1 other bought this item recently. The Mr. Salt-E E-Liquid Bundle comes with the Top 5 Mr. Salt-E Best Selling Flavors. 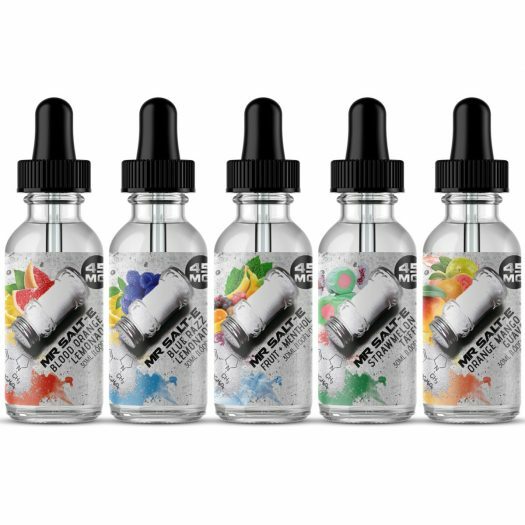 Blood Orange Lemonade, Blue Razz Lemonade, Fruit + Menthol, Strawmelon Taffy, & Orange Mango Guava. Total 150mL of Nicotine Salt E-Juice This Nicotine Salt E-Juice is available in 25mg & 45mg Strengths. Not for use in Sub Ohm Atomizers. Meant for Closed System / Pod System Devices with Low Output.